If you are stuck for stocking stuffer ideas, remember: there is no better present than a pair of stylish sunglasses that will protect your kids’ eyes from harmful UV rays. Here are our suggestions for some great stocking stuffers for kids of all ages. My First Shades and Explorer sunglasses protect little one’s eyes and the delicate skin around the eyes from the sun. Specially-designed to suit the tiny faces of children less than a year old, an adjustable band keeps these shades secure and comfortable. 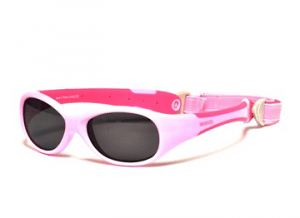 The sunglasses come in a range of colors and cute patterns. Plus, Explorer shades are available polarized to improve babies’ ability to see during an important stage of life when vision is developing rapidly. It can be a challenge to find gifts for toddlers that will not end up broken after just a few minutes. Luckily, we have just the thing for you: Explorer, Explorer Polarized, Surf, and Sky shades all have unbreakable frames that can bend in all directions before bouncing back into their original shape making them perfect for kids aged 2 and over. We understand that kids as young as 4 years want to look cool, which is why our range of sunglasses are so fashionable. Choose between Explorer, Bolt, Breeze (all available polarized), Surf, and Sky. Give your kids aged 7 and over a gift that will be useful for activities in the coming year. Bolt, Breeze, Blaze, and Storm (with or without polarization) are perfect for sports, while Surf and Sky shades are super stylish. By the time kids are aged 10, they want shades that make them look grown up, but it can be difficult to find a pair that fits their smaller face. At Real Kids, we have several to choose from: sporty Blade and Blade Polarized, fashion-forward Shine, and iconic Sway and Fly are all options. Check out our full range of products online or find a retailer of Real Kids sunglasses near you.